Animals farmed for their fur are denied their most natural behaviours and live in bare wire mesh cages until their deaths. In comparison to the richness of the natural lives of these emotional, intelligent animals, the chronic deprivation and extreme confinement causes animals to suffer both psychological and physical damage. With nothing of interest to occupy these inquisitive and highly active animals, they literally go insane with boredom. Unable to protect them from this inherently cruel industry, regulation and certification is failing these animals. Despite fur industry claims that methods of killing are quick and humane, the reality is a different story. Animals in fur farms are electrocuted and gassed to death in their millions; some animals are not killed outright causing prolonged suffering. The reduction of sentient animals to a mere product, bred and killed purely for vanity, is unethical. It is time to change. The majority of the public is against the wearing of fur, but the cheap cost of real fur and lack of labelling can dupe and confuse consumers. The only way to stop the suffering is through prohibitive legislation and for designers and retailers to remove themselves from this cruel trade; this is especially important in countries where fur farming has been banned, like the UK, but which still import, export and sells fur products. Fur is never humane. 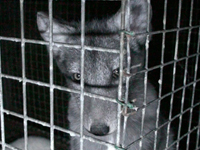 When you buy fur you buy cruelty.